If something seems to be going wrong on the app, the first step to try is to close the app completely and then re-open it. To close the app this, double-click the home button, and then swipe up on the Trello app. If the problem continues after closing and re-opening the app, there are a few things you can try to fix the problem: clearing the cache, logging out of the app and back in, or reinstalling the app. WARNING: These actions will clear any offline changes you've made to your boards that haven't been synced yet, so make sure to check for unsent changes before proceeding further. Check for unsent changes first! If you've made changes to your boards while offline, the troubleshooting steps described further down will prevent these changes from being synced. Fortunately, there are a few different ways to check to see if you have any unsent changes. 3. Finally, you can go to the Sync Queue in accounts and check to see if it has items in it that aren’t errors (if they're errors, they'll have red text beneath). If you see any of these indications that you have unsent changes, clearing the cache, logging out and back in, or reinstalling the app will cause you to lose these changes. To prevent this, the best course of action is to get back on a network so that the changes will sync. If that doesn't work at first, try closing the app completely by tapping on the home screen and swiping up on Trello, and then reopening Trello. If the changes still don't sync after that, check to make sure that the network is working by opening a webpage in your browser. If you're not able to get on a network, or if the changes don't send for some reason, you can export a list of the changes so that you can redo them later if they're lost. To do this, open the app and go to the Account tab. From there, open the Sync Queue. Tap on the share button to send yourself a text description of the changes. After you've confirmed that you don't have any unsent changes, or after you've exported the Sync Queue as a backup, you can safely continue with the troubleshooting steps below. Sometimes, cached data in the iOS app will cause your iOS device to be out of sync with the web interface. To clear that, open your phone's Settings app, and scroll down until you see the Trello app listed. Tap on Trello, and then enable “Clear on Launch” on the next screen by tapping the slider next to it. Next, you'll need to close Trello and relaunch. To do this, first double-tap your home button. You should see all the apps open on your device. Find the Trello window, and slide it up to close it. It will disappear, indicating that it's closed. Then, tap your home button again, and tap the Trello app to reopen it. If clearing the cache doesn’t help, you may want to try logging out of the app and back in. To log out, first open the Trello app and tap on the Account tab from your main home screen (this will be in the bottom right on the iPhone or the top left on the iPad). From here, you can select “Log Out”. 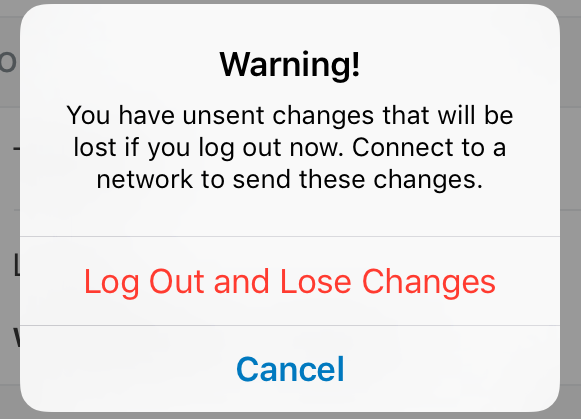 In this case, try to get back to a network so that your changes will be synced before logging out, so that you don't lose these changes. Once you’ve logged out, select “Log In” to sign in to Trello again. If the problem persists, you can also reinstall the app. Tap on the Trello icon on phone’s home screen and hold down until the icons shake and an “X” appears in the corner of each icon. Tap on the “X” for the Trello icon — this will remove the Trello app from your device. Next, open the app store app on your phone and download Trello again. You’ll need to log in again. 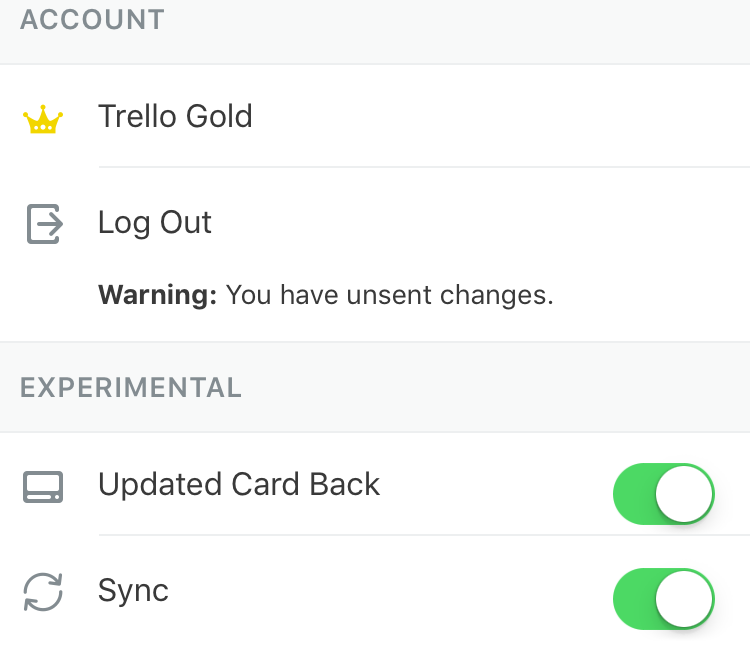 If you purchased Trello Gold on your phone previously, you’ll still have access to this once you log in. If you continue to see the same problem after trying these steps, let us know and our support team will be happy to help!